Once in awhile, a rare car comes up for sale and we remark on the rarity and the cost. Today is “once in awhile,” because another supercar produced in extremely limited quantities is heading to auction. It’s a Ferrari [NYSE:RACE] Enzo, and this one is the property of none other than fashion designer and retailer Tommy Hilfiger. Mr. Hilfiger must’ve preferred other modes of transportation because this example shows just 3,622 miles on its odometer. By now you know the facts and figures of this car, but it certainly bears repeating. Ferrari crafted just 399 examples (plus one extra for the Pope) and there are certainly less than that still kicking around due to accidents. This specific car wears an assembly tag bearing the number 50152. It’s part of the first run of 349 cars offered for sale before the automaker produced the rest. Out back is the magic maker, which is otherwise referred to as a 6.0-liter V-12 engine. At your beck and call you’ll find 660 horsepower and nearly 490 pound-feet of torque, which are used to push the Enzo from 0-62 miles per hour in just 3.2 seconds. The car is slated to hit the RM Sotheby’s auction block in January. 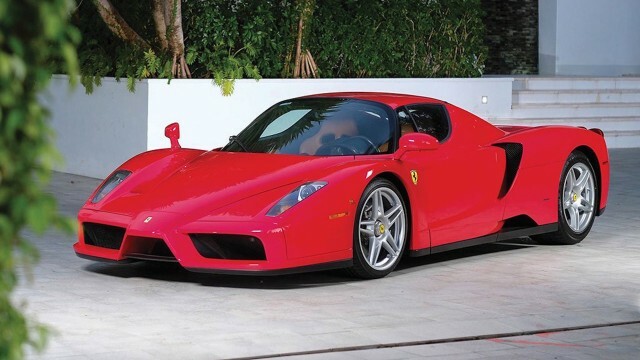 An Enzo is currently fetching somewhere between $3 and $4 million on the auction circuit. There are three listed on JamesEdition at the moment, with two of the cars asking for around $2.3 million for the keys. You can expect this ultra-clean example to fetch a sum on the higher side of the current market price point.